MODUS is the powerful platform that fully supports the Revolution® line of CMM’s and 5-axis measurement. 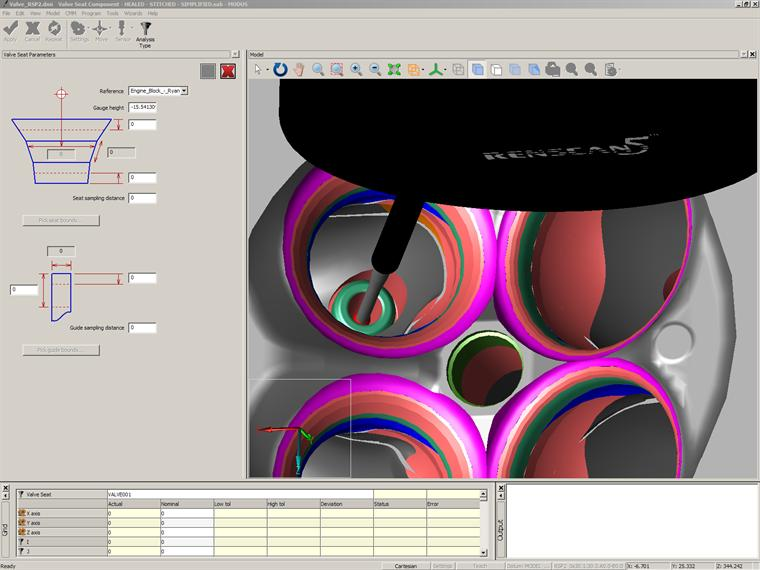 A configurable user interface allows native DMIS programs to be developed offline, the drawing of geometry, embedded dimensions and tolerance data from CAD, feature construction and part alignment. 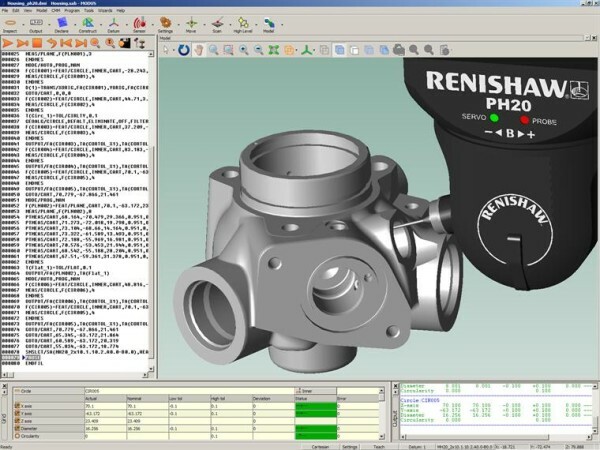 It includes full support for I++DME compliant metrology controllers – including Renishaw’s UCC range of universal CMM controllers, CAD-driven offline programming with on-screen probe path verification (the CMM environment, fixture and the location of the part on the machine can all be defined, enabling full simulation and crash detection of 5-axis measurement programs), high integration with CATIA® (v4 and v5), Siemens® NX™, Pro/E® and Solidworks® CAD/CAM solutions to name a few. All features of MODUS are very valuable for the CMM operator, but some of the biggest benefits and, not to mention, user friendly additions include: full simulation and collision detection (this minimizes CMM down-time as programs arrive at the machine ready to run, with little or no prove-out time required), native DMIS support, certified mathematical algorithms (for feature measurement), powerful text and graphical reporting, flexible output of results data including certified Q-DAS. QC-CALC Real Time – is used to collect and display measurement results from all CMMs, Video CMMs, and hand gauges without operator intervention. You can create reports and export data to spreadsheets, databases, and other SPC programs. This means you can transfer data from all of your measurement devices to any SPC package using one program. This is the first program to provide one interface for all machines and one interface for all outputs. The goal is to make your data collection seamless no matter what equipment you’ve purchased or software you use. 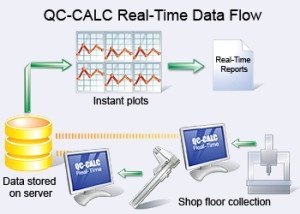 The seamless integration with automated gauges is the cornerstone of QC-CALC Real-Time. Our relationships with the equipment suppliers enable us to understand how their gauges operate and to automate reading their output. QC-CALC eliminates any effort on your part to collect the data so you have absolutely nothing to do except watch the graphs plot and the automatic reports trigger. 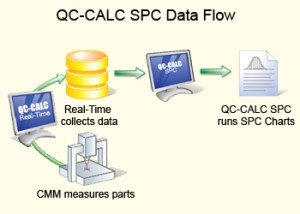 QC-CALC SPC – a complete SPC package that analyzes the data collected by QC-CALC Real-Time. Use QC-CALC SPC’s charts and reports to constantly monitor your process and keep it in control. This option offers a wide variety of charts and functions to aid your analysis and give you the power to make on-the-spot decisions. In seconds, QC-CALC SPC gives you a precise picture of how your production line is performing with easy-to-use menus. It also lets the user group data from multiple sources, filter it, monitor the shop floor, and run charts with a couple clicks. QC-CALC Enterprise – it is the equivalent of QC-CALC Real-Time and QC-CALC SPC installed on the same computer. QC-CALC Office Buddy – a revolutionary application that integrates directly with Minitab, JMP, and MS Excel to run reports using CMM data collected by QC-CALC Real-Time. This direct integration virtually ends manual data entry once and for all. The Buddy allows you to set up custom filters to reduce your data before sending. When finished, you can run statistical reports or Sixpacks on any subset of your data and then place these charts into your Excel reports in the location of your choice. The Buddy automatically sends each feature’s label, nominal, tolerance, and subgroup information straight to Prolink Charting, Minitab, or JMP without typing. Additionally, the Buddy displays your collected measurement data as a grid of numbers that you filter by both rows (records) and columns (dimensions). 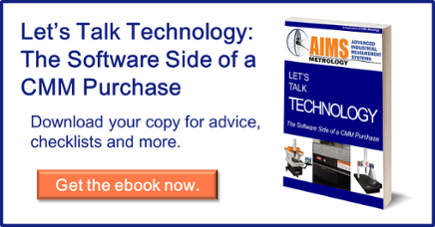 It can then run either Prolink Charts or Minitab charts with the click of a button. This saves an enormous amount of time since all nominal and tolerance data is automatically sent to the chart. The data and charts can then be automatically placed into the custom Excel report of your choice in the exact location you specified.If using Prolink Charts, you also have the ability to place statistical calculations directly into your custom Excel reports. QC-Sort – This nonstatistical application is used in conjunction with QC-CALC Real-Time to quickly identify bad parts on a multiple-part inspection fixture. QC-Sort makes it easy for your operators to remove problem parts from the fixture by using color coded squares to identify the bad parts. QC-Sort is adjustable and easily configured to display the physical layout of your parts as they are fixed. 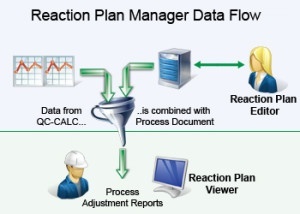 The Reaction Plan Manager (RPM) provides productivity tools to reduce complex measurement information into step-by-step machine adjustments. Deciding how to react to a broken or shifted process is critical. Part size and statistical reports may indicate the process has drifted but knowing what adjustments are required is difficult. By using RPM, you combine measurement data with engineering knowledge to analyze the process in real-time and provide specific instructions to fix the process. The software is made up of two applications to build (Editor) and view (Viewer) Reaction Plans. A Reaction Plan is a stored document containing math algorithms to analyze measurement data, program code to manipulate data, pictures, graphs, and operator instructions to clearly explain operator actions. The document could be compared to a finely tuned Excel macro. When combined with live data, the Reaction Plan contains the specific instructions needed to fix the process.